In order to please the world’s richest people, luxury restaurant chefs invented a series of dishes that only millionaires can afford, with price range of thousands of dollars. Sometimes, the omelet made for rich men contains caviar and lobster and can cost up to $1,000, a pizza with salmon, caviar and white truffle comes to cost more than $4,000, and the desert, also very extravagant, sold for an exorbitant price that the average working Joe could never afford, more than $5,000, if we speak of chocolate truffles. Even the coffee, named Kopi Luwak (see the article), costs around $600 per Kg of beans, and for the Tieguanyin green tea some people pay up to $3,000 per kg of dried leaves. 1.Matsutake Mushrooms – $2,000 per kg. These mushrooms are so expensive and for good reason, because the mushrooms’ annual output is less than one thousand tons. They have a special perfume and flavor, and they lend it to all the other food elements that are on the same plate. 2. The most expensive Bagel (pretzel) in the world costs $1,000. This pretzel, created by the Executive Chef Frank Tujague for the Westin Hotel in New York, is topped with white truffles cream cheese, Goji Berry infused in Riesling, and jelly with gold leaf. 3. The most expensive omelette in the world – “The Zillion Dollar Frittata” costs $1,000. The extravagant omelet has in its composition eggs, lobster and 10 grams of sturgeon caviar. One can order it from the “Le Parker Meridien” restaurant in New York. 4. Wagu Steak costs around $2,800. This meat is obtained from Wagyu bovines, that are assumed to be fed only with beer and massaged by hand. This breed is raised only in Hyogo, a region of Japan, and the recipe for the preparation of meat and the breeding’s culture is secret, and is kept according to thousands of years tradition. 5. The most expensive curry, Samundari Khazana, also called the “seafood treasure”, costs $3,200. 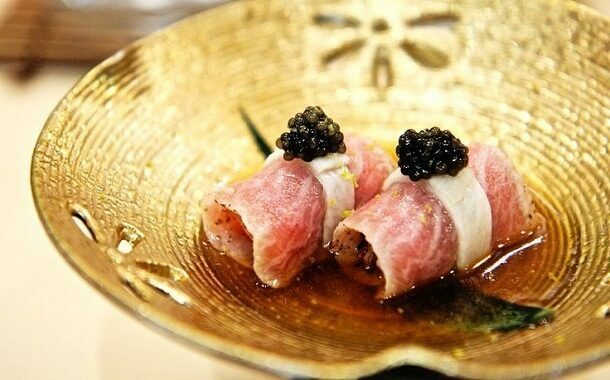 It is prepared with Devon crab, white truffle, caviar, gold leaf, a Scottish lobster wrapped in gold and four quail eggs. 6. Domenico Corolla’s Pizza costs $4,200. It is a 30 cm pizza prepared with some of the most expensive ingredients in the world, including lobster marinated in cognac, caviar soaked in champagne, smoked Scottish salmon, venison medallions, prosciutto, white truffle and obsolete balsamic vinegar. 7. Densuke watermelon costs $6,100. In Japan, melons are considered to be rare fruits. The Densuke watermelon grows only in northern Japan, on Hokkaido island. Densuke watermelons are black, sweet and with a harder-shell, according to agriculture specialists. Their price is justified because at the annual harvest only around 10,000 melons are gathered, although there are statistics with an annual harvest of 650 melons. 8. Yubari Melon costs around $23,900. Cultivated in Japan, in the Yubari region known for the fertile volcanic soils, these melons are considered the sweetest and juiciest fruits. Yubari melons are harvested manually and sent to a Japanese agricultural association to receive grades, and after that they can be sent for sale. In 2008, two such melons were sold for the amount of $23,900. 9. Almas caviar comes from Iran and is produced in portions. In Europe you can find it at Caviar House & Prunier in Picadilly, in London, and it is sold in a box plated with 24 karat gold at a price of $25,000 per kilogram. Almas in Persian means diamond, and the spawns are collected from a sturgeon female, but it has a limited production capability. 10. Alba white Italian truffles cost around $160,000. It is not a surprise that most of the rich people no longer prefer caviar, but another rarity, the Alba white Italian truffles. The Associated Press reported that a real estate investor and his wife from Hong Kong paid about $160,000 for 1, 5 kg. 11. The $1,000 ice cream. Is considered by far the most expensive dessert in the world and is made from Tahitian and Madagascar vanilla ice cream, edible leaf of 23 Karat gold and one of the most expensive chocolates in the world – an Amedia Porceleana assortment. Finally, the ice cream is seasoned with truffles and caviar. 12. Chocopologie is a truffle chocolate whose price goes up to $5,200 per kg. It is made from a black truffle and 70% Valrhona cocoa. Chocopologie is the most expensive chocolate in the world and you can taste it only if you place an order in advance. 13. Kopi Luwak Coffee costs up to $700 a kilogram and comes from the Indonesian island of Sumatra. The total annual production is about 220 kg of grain and this explains the high price. 14. Tieguanyin – Chinese green tea. A kilogram of Tieguanyin costs $3,000, which means that a cup would cost about $15 at bulk price. 15. Club Von Essen Sandwich costs about $200. It is a “fancy” sandwich, made from carefully chosen ingredients, such as dried tomatoes, Iberico ham, produced only in Spain from Iberian black pork, organic mayonnaise, white truffles, Bresse chicken, raised in traditional farms for at least 16 weeks, that isn’t treated with antibiotics, quail eggs and a special bread called Sourdough. 16. The Japanese Wagyu beef is the most expensive beef in the world. 200 grams of fillet cost in Europe more than $100. 17. French Potatoes “La bonnotte”. This type of potato is endangered and therefore, a kg can be sold for about $500. 18. Macadamia nuts – one kilogram of Macadamia nuts costs over $30. The high price is justified by the fact that shrubs produce nuts only after 7 to 10 years of life, and their bark is so tough that it must be removed before sale. 19. Saffron. It is the worldwide most expensive spice and the price of a kilogram ranges from $1,100 up to $11,000. Approximately 150,000 flowers are needed for one kilogram of dried saffron and 2,000 square meters per kilogram of harvest. This explains the exorbitant price. 20. The most expensive pie in the world was made for the first time in 2006 in England. Back then it was the most expensive in the world, about $15,900, for 8 servings. Such a pie contains beef meat worth $1,000, Chinese mushrooms worth $3,300, black truffles, a decorative gold leaf and two bottles of Chateau Mouton Rothschild, from 1982, worth $4,200 each! Should the average Joe eat any of these dishes? If you’re working on an average wage and you’re trying to provide for your family, then none of these dishes should be on your menu. They aren’t worth hard worked money and any of these dishes could be replaced with a family vacation or even home electronics, appliances, clothes or other house items you might need. How Much Will Hover Camera Cost? How Much Does The Ring Clock Cost?